The first batch of The Only Way DVD's were finally completed yesterday. The Only Way will continue to be for sale on it's official website (http://dvd.theonlywaymovie.com/) and beginning tonight, will also be available for purchase at the Ten Thirty-One Pictures booth, during Old Settlers Days in Metamora, Il (June 20-23). REMEMBER if you order online, or were a cast/crew member you get a discount. 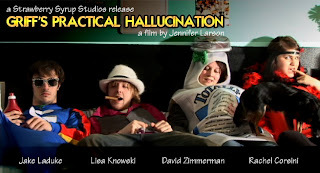 I have also unleashed the Strawberry Syrup Studios Production "Griff's Practical Hallucination" on youtube (Directed by Jennifer Larson, starring Jake Laduke, Lisa Knowksi, Me, and Rachel Corsini). You can find it by going to the following link: http://www.youtube.com/watch?v=zKk7q_tWKAw. A behind-the-scenes music video for this film will be posted on youtube later this week. I am putting the finishing touches on the shooting script for "Project Trapped" and doing storyboard sketches. We plan to begin shooting that project in July after I return from Vacation. We shot in the Edwardsville office on Monday for the New Employee Orientation DVD (because its my job). Work continues on The Plymouth Court Shorts vol. 2 DVD - I'm currently completing the opening DVD montage with new music by Jake Laduke. Basically I'm just keeping busy and preparing for things to come.